Blair Trygstad, a 2008 member of the Bluecoats color guard, submitted this photo and caption. 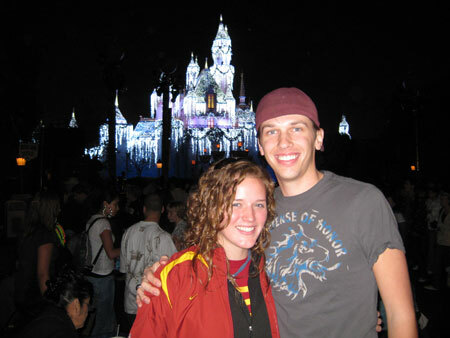 This is a photo of Jason Schickel and me in front of the Magic Castle at Disneyland during Magic Music Days. We were both members of the 2008 Bluecoats and reunited as rivals when both of our current college bands met for the 2009 Rose Bowl which featured my USC Trojans defeating his Penn State Nittany Lions. It was fun to see an old friend to reminisce about our drum corps experience and talk about our college bands. I wish I could have a drum corps friend in every rival college band. Six words and Fight On!